Isn’t osmosis amazing? Grapes swell. Roots absorb. Skin rehydrates. You know everything in the textbook that you slept with under your pillow last night…Well, all but the last one. Who thought up water? Something so simple. Two H’s and an O. Specialized bonds that share charges in a way that attracts or repels. It designs its own environment. Goes where it pleases and in fact heads into the areas where it’s under-supplied. Where it’s needed most. Thirst is quenched, by chemical design, when water flows. He satisfies the thirsty, and the hungry he fills with good things. But just add water and voila! Wrinkles fixed. Cracks filled in. Hunger satisfied. Whole again. Useful again. Beautiful again. Fruitful again. Humanity is thirsty. We hunger and eat but are not satisfied. We are cracked and broken. Leaking in our disrepair. We thirst for a drink that will fill us to overflowing. What a beautiful image. 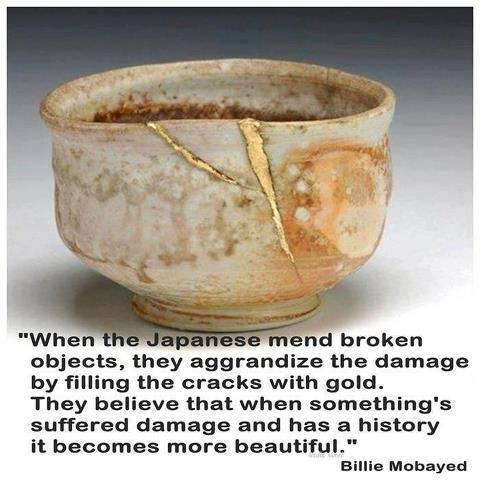 Our cracks filled with precious gold, more beautiful in their repair. Quenched and overflowing with water for a parched land. A thirsty humanity. Just a drink of water.